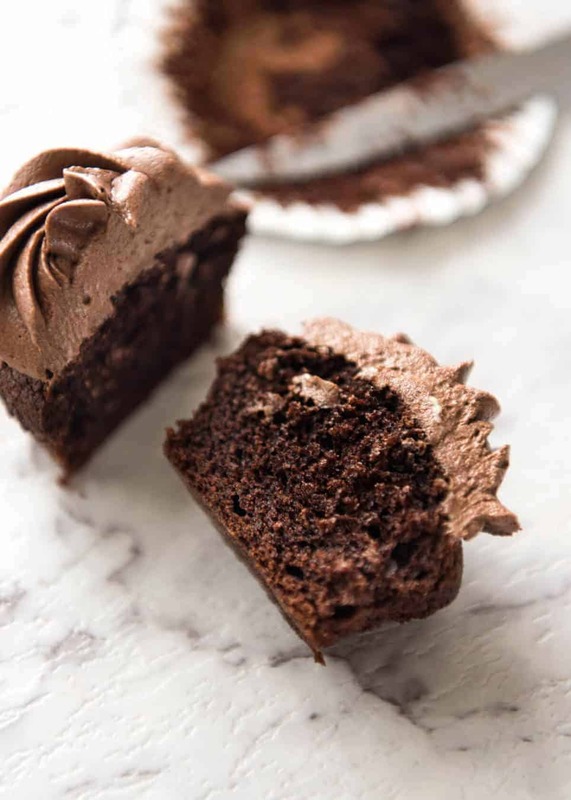 The Best EASY Chocolate Cupcakes are moist, have a tender crumb, are deeply chocolatey and made without an electric beater. 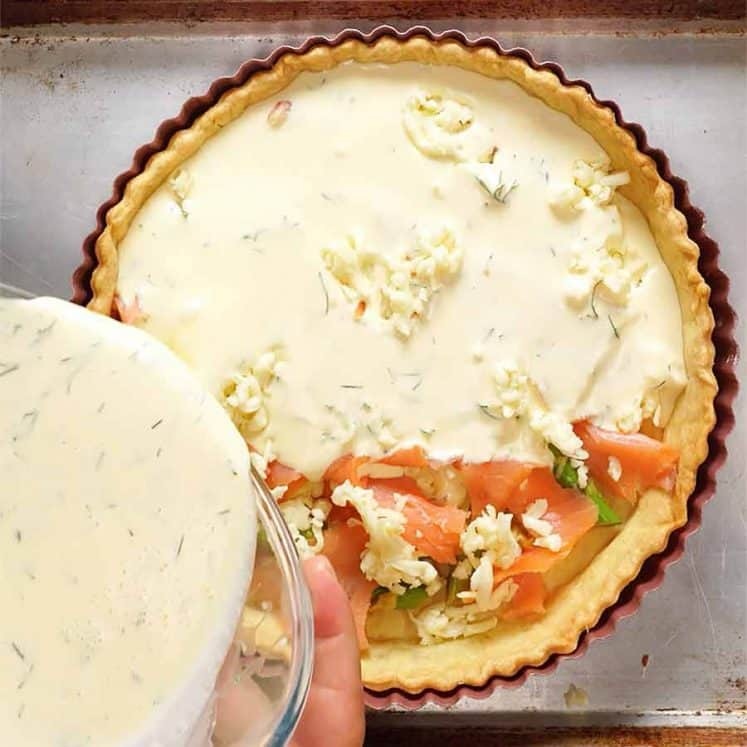 No waiting for butter to soften, no creaming, the batter is simple and quick to make. These are the cupcakes I make most often – with good reason! Using the term “BEST” is not something I do lightly. I do feel a bit uncomfortable saying that these are the BEST Easy Chocolate Cupcakes. But in the cupcake world, I truly do believe these to be the best that can be for a simple no-standmixer, no creaming butter recipe. I was back and forth about which cupcake recipe to share. I was tempted to go for a “100% perfect” version which requires a stand mixer / electric beater to cream butter. And I wanted to be able to talk to you about how perfect they are. But you know what? The Perfect version is not the one I make the most. This Easy version is. It’s my “go to”, the one I can make right now, without waiting for butter to soften, without pulling out my hand beater. And the difference between this Easy version and the Perfect version is so insignificant, I don’t care. Have a very slight dome with a soft (not crusty), blemish free surface. 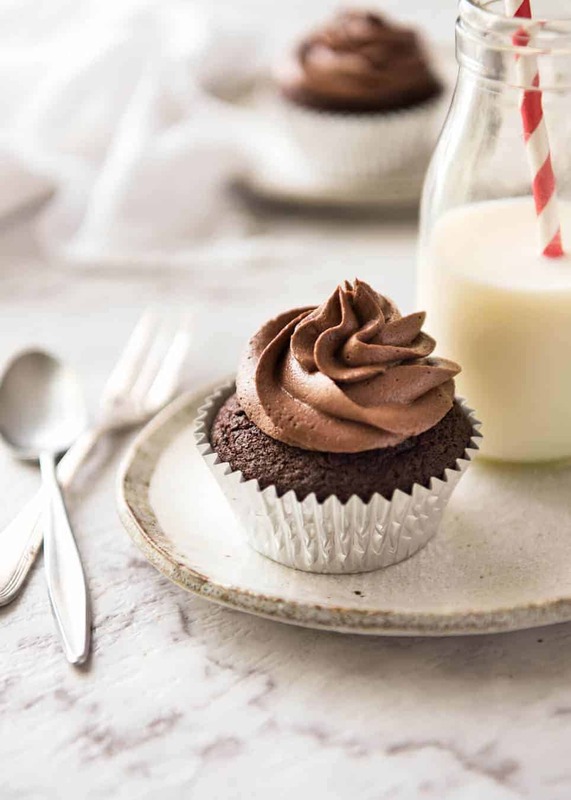 This EASY Chocolate Cupcake recipe ticks all the boxes except #5. The Perfect version I use is….well, it’s perfect. The dome is slight, it’s always even, and it’s smooth and blemish free. Whereas this one is blemished. In the photos below, see how there are minor cracks? And the dome is slightly higher than it should be. And I don’t care. Not in the slightest. Because no cupcake ever leaves my kitchen without frosting!!! I was swayed by the pretty swirls I wanted to use in the photos. 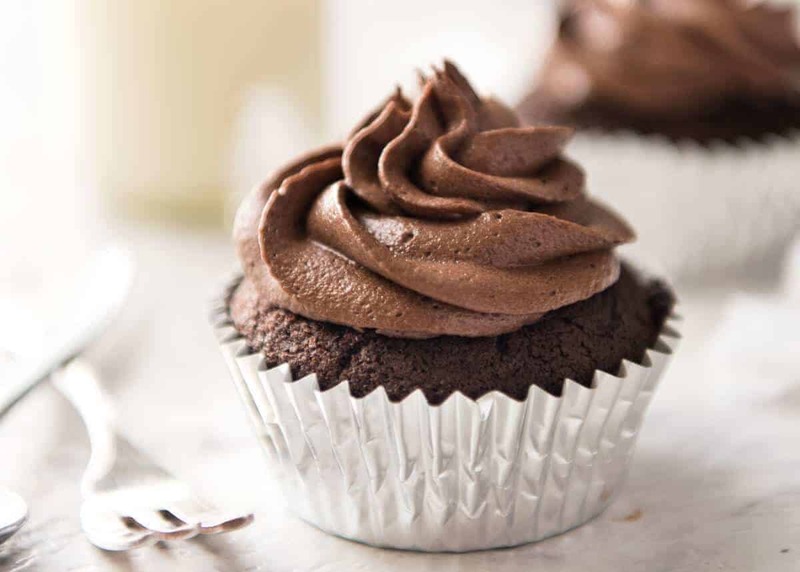 But actually, when I make these Easy Chocolate Cupcakes, I usually make a quick Chocolate Fudge Frosting made with melted butter. 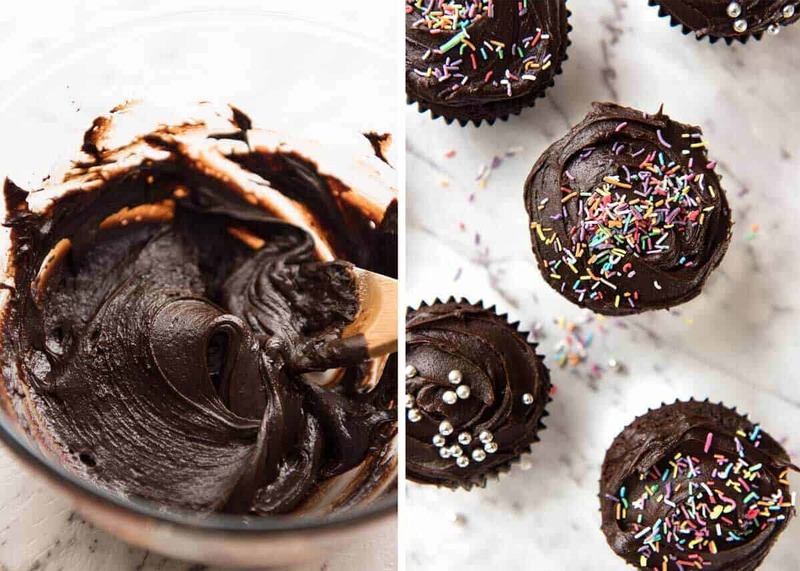 This is my everyday chocolate frosting because it takes minutes to make, it has a buttercream-like consistency (but obviously not as fluffy because you don’t have to beat it for 10 minutes! ), smooth and spreadable and pipe-able (but I don’t, too lazy). I also like that this Chocolate Fudge Frosting is a lovely deep chocolate colour (Chocolate Buttercream is a pale brown colour). Perfect for scattering with sprinkles – so pretteeee! I’ve shared the Chocolate Buttercream Frosting in a separate post because I think it’s worthy of being a separate recipe. 🙂 Also because I’ve done a video for that too – I didn’t want to cram it into the cupcake recipe video. 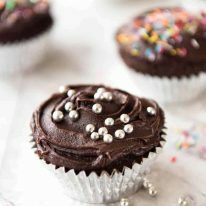 The simple batter for these cupcakes is made with melted butter, so no beater is required to cream butter. 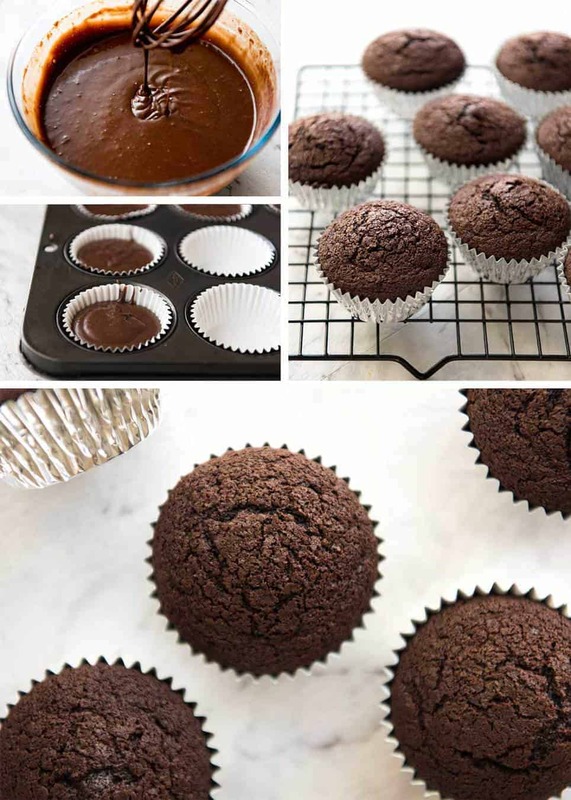 The cupcakes are moist (and they stay moist), have a tender crumb, are deeply chocolatey and the recipe is more forgiving than most cupcake recipes. The only reason these would not be considered "perfect" by experts is insignificant to me - the surface is not blemish free and smooth, and the dome is ever so slightly higher (see photo in post). But when you pile the frosting on, no one knows! VIDEO below. Preheat oven to 180C/350F(standard) or 160C/320F (fan / convection). Put oven rack in the middle of the oven. Place 12 cupcake liners in a cupcake tin. Sift Dry ingredients into a bowl. Whisk briefly. Place butter and chocolate in a separate, large heatproof bowl. Microwave for 45 seconds, mix, then microwave for another 30 seconds. Mix until chocolate is melted and smooth (keep microwaving in 20 sec bursts if chocolate not melted). Add milk and oil, then eggs, vanilla and vinegar. Whisk until smooth. Add flour mixture and whisk until lump free. Divide mixture between cupcake liners. I use a ice cream scoop for this. They should be just over 3/4 full. Bake for 18 - 20 minutes, or until skewer inserted into the cupcake in the middle of the tray comes out clean. Remove from oven and immediately transfer to cooling rack (spoon or knife helps). Once cool, spread with frosting and decorate with sprinkles if desired. Alternatively, use Chocolate Buttercream Frosting! Melt butter and chocolate in a large heatproof bowl (45 second on high, followed by 30 seconds then 20 second bursts if required). Mix until smooth. Add icing sugar and milk. Mix until smooth. Use milk to adjust consistency if required - it should be a soft spreadable consistency (like peanut butter). 1. You can substitute the bi carb with 1 1/2 tsp baking powder. The cupcake is not quite as fluffy, but it is still lovely and soft. 2. Use dark chocolate purchased from the baking section of the supermarket, not eating chocolate. You can use any dark chocolate you want, but a good quality one with 70% or more cocoa (will say on packet) will give a better chocolate flavour. 3. Dutch processed cocoa has a more intense chocolate flavour than normal cocoa. However, you can use normal cocoa if you want. 4. For BAKING NERDS: Mixing cocoa powder with hot butter (or hot water, as is usually done in recipes) makes it "bloom", enhancing the chocolate flavour. Also, I add the milk and oil first into the melted butter mixture to bring the temperature down so you can add the eggs without worrying about the heat from the butter "cooking" the eggs! 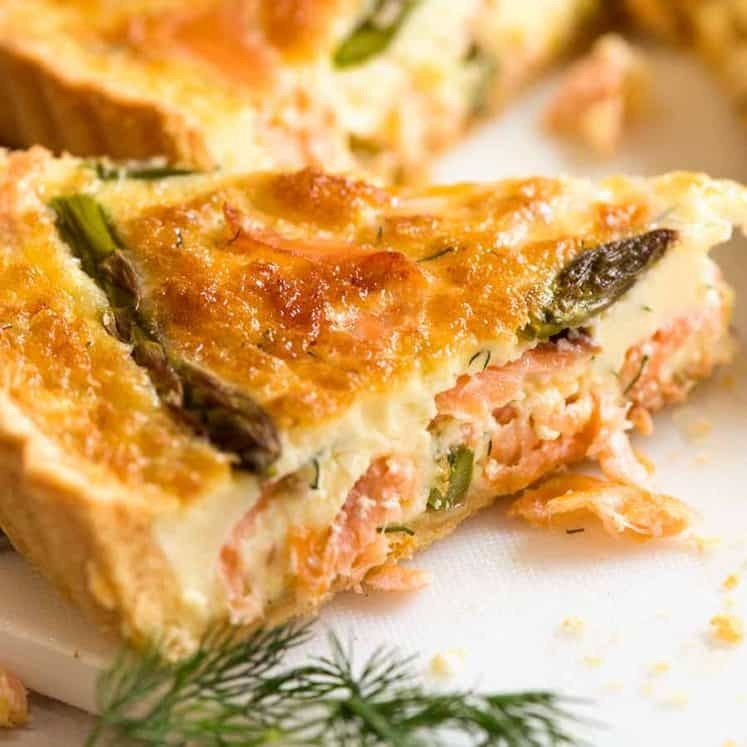 This recipe is deliberately and specifically made with both oil and butter. Butter for flavour, oil for moisture. Cup sizes in the US are slightly different to those in the rest of the world. 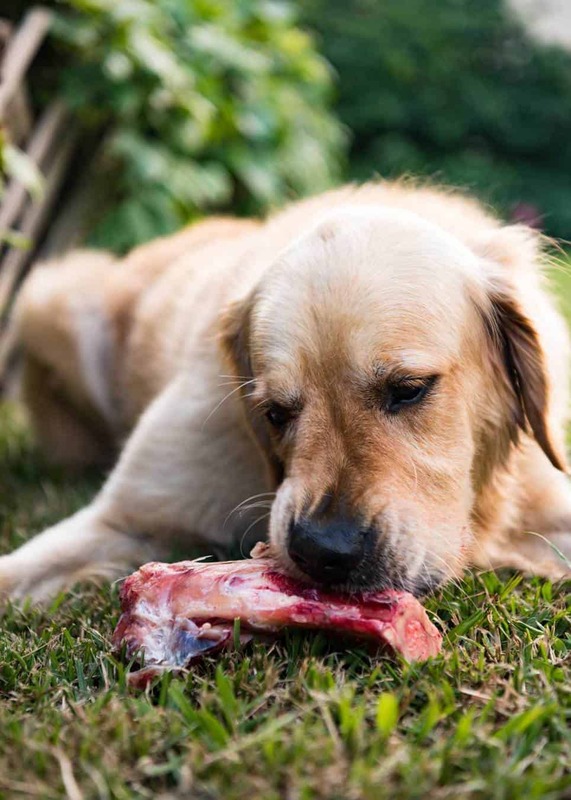 For most recipes, the difference is immaterial and won't affect the recipe. For baked goods, it can matter. 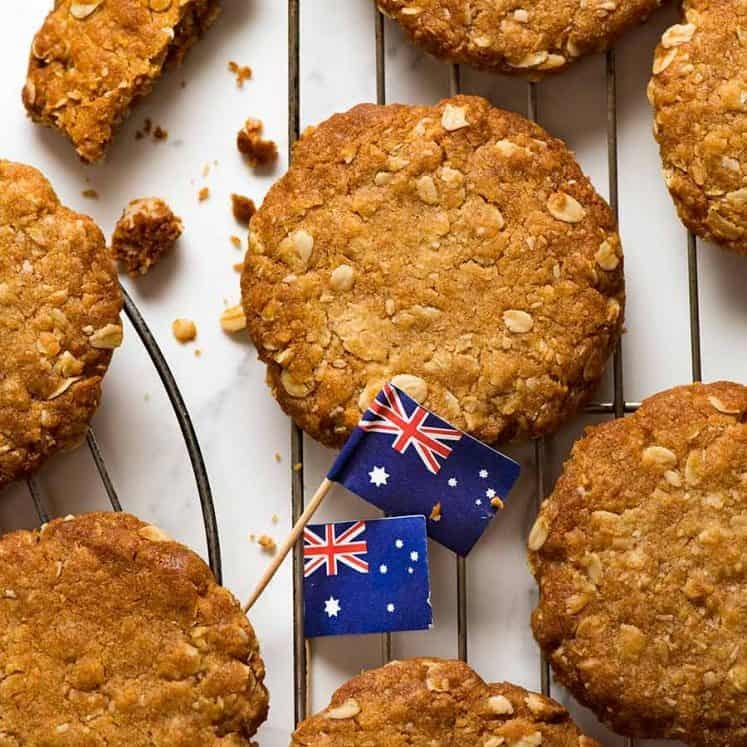 I have made this recipe using US cups, Australian cups (same as UK, EU) and weight measures and noticed no difference in the results. I find this recipe pretty forgiving compared to most cupcake recipes - because it's made like a quick bread / muffin batter. 5. 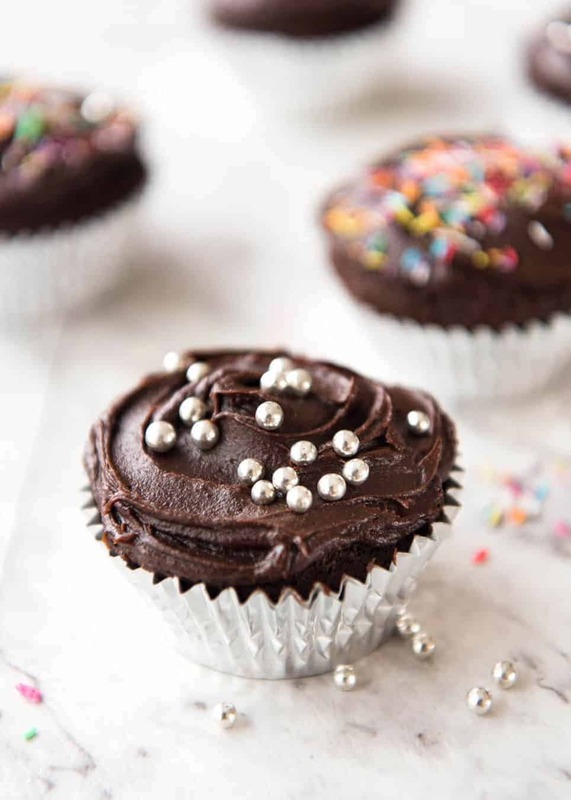 The Frosting recipe makes enough to slather each cupcake quite generously - around 2.5 tbsp per cupcake. If you want less, use the SCALER (hover over servings) to reduce the butter to 70g - this will make enough frosting to just spread frosting on each cupcake. 6. These cupcakes stay beautifully moist for 2.5 days, in an airtight container. If it is very hot where you are, refrigerate them (because of the frosting) but ensure they are brought to room temperature before serving. They also freeze great (even with he frosting) - I've made so many in recent weeks, I've been freezing tons of them! 7. 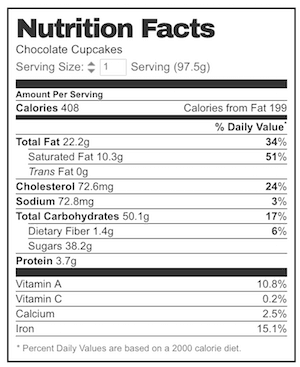 Nutrition includes the Chocolate Fudge Frosting. Best Easy Chocolate Cupcakes recipe video! Hi! Can I use this recipe to make a cake? If so, would an 8×8 inch or a 9×13 inch cake work? These are just divine. Ordinarily I’m not much of a baker but this must be a foolproof recipe as they turned out superbly. Thanks Nagi. Perfect Anna, thanks so much for letting me know what you think! Dear Nagi, These are the cupcakes you’d want to share with your friends, relatives, colleagues, the neighbourhood watch and the mailman. Except I ate the whole lot myself. In one sitting. They were fabulous even though I took a chance and subbed buttermilk for the milk which is not a staple in my kitchen. I’m so chuffed! I swear I’ll share them the next time. The world needs to know what an awesome baker I am! Oh and your red velvet cake recipe? I ate nearly the whole cake too but the bf snatched a couple slices when my back was turned. Just so you know, these two cakes are the only ones among the ten or so I’ve tried to make that have not turned out to be spectacular disasters. Many many thanks! It’s really good! The texture is so fine and melts in your mouth. No wonder the kids love it. Thanks May! I’m so glad it was a hit with the kids! I just made this with my 2 year old for her special first baking experience and it was great. She loved it. Thank you. I think you’re meant to write cocoa powder instead of chocolate in step 1 of frosting. I am a dummy when it comes to baking. Gave this recipe a try and it worked !! My kids love them. Thanks Nagi. By the way, can I use the same recipe for smaller cupcakes ? Less baking time ? I made these with my 4 year old. they were so easy to make and turned out really good. I will be making these again. These are the BEST chocolate cupcakes ever. With the fudge frosting. They even taste better on the 2nd day, the 3rd day, the 4th; they just keep getting better and better and stay soft. Love them! They’re the only chocolate cupcakes I make from now on. Thank you for the recipe! great recipe, thank you 🙂 I added chocolate chips in the end and they were amazing! These look awesome thank you, going to give them a try but don’t have the chocolate to melt. I’m wondering if there a way to change the mix slightly to allow for no melted dark chocolate? I made a cake using your chocolate cake recipe, and it is amazing, but when I tried to make just the frosting from here, my fats split and were just floating on the top. I microwaved it a few times and was able to whisk it smooth, but it’s more like a thick cooled ganache. It was okay until I added milk- where did I go wrong? Beautiful, soft, and really chocolatey! So nice not to be creaming the butter and sugar. On the off chance there are any left tonight, can they be frozen once they’ve had the frosting applied? Thank you, thank you for (another) amazing recipe. Ok. So I bake a LOT and have tried countless cupcake recipes. I’ve had some great ones and some fails. I hardly ever comment on recipes. This one, however, deserves a comment. It’s amazing! It’s easy, delicious, and that fudge frosting? Heaven. 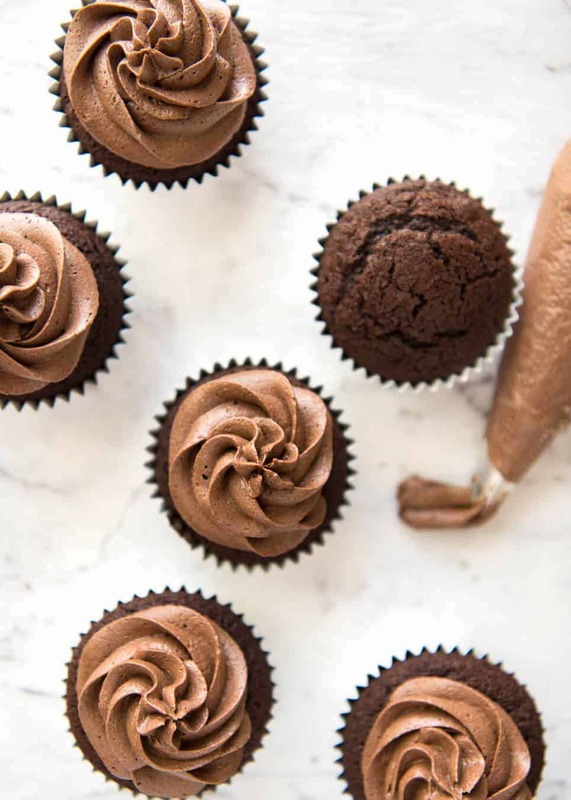 THANK YOU for posting this recipe and making the best chocolate cupcakes ever! Is that ok if I add some chocolate chips in the batter before I bake? Do I need to change anything? I had to make these. Been eyeing them for a few days. Nagi, they are so good, I wish I would have doubled the cake part. Thank you for your ideas they are the best. Can’t wait till my older daughter comes back and finds these yummy little morsels calling her. Took a picture but didn’t know how to get it here.